Please follow the link below to sign the petition the Golden Baggers have set up in order prevent the needless destruction of the established trees that currently line the border of the allotments and the proposed COLPAI development. Here are a few of the younger folk creating banners over the weekend. 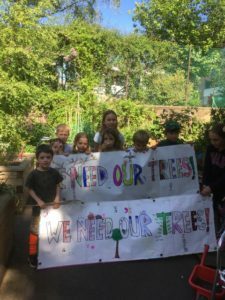 The destruction of the trees would be a travesty – they should be saved for the benefit of residents and children of the new school alike.